Currently, the Ramon y Cajal program is almost the only “official” way to get into a sort of tenured-track position in Spain. The “Ramon y Cajal” 5-year contracts are funded by the Spanish Government and are addressed to professional researchers in possession of a PhD degree who have presented a line of research. Applicants must have obtained their PhD degree in the last 10 years and have carried research abroad for at least two years or have their PhD abroad at least two years before the call. This year, as I had already done the two previous years, I applied for a “Ramon y Cajal”. I submitted my application for the “Material Science and Technology” panel (my last year’s application was in the Physics panel). I have just known that my application has been denied and, according to the evaluation I have received, I have ranked 55 in the panel. Only the 14 top candidates have been awarded with a “Ramon y Cajal”. So I was not even close to get it. The evaluation I have got has made me angry enough to to make me want to share it here. These contracts are scored from 0 to 100 point, 50 points depend on the contributions in the CV (i.e. basically publications), 25 point in the participation of international activities, 5 points in other CV merits. The final 20 points depend on the capacity of the candidate to lead an independent research line (this is a sort of more subjective area). Since the start of the PhD approximately in 2005 the candidate has achieved a good publication record which amounts to more than 50 publications and a relatively high h-index. The candidate is also a recipient of a M-C IIF. The candidate reports 6 papers as the only author and 31 as first author. There is one very high impact journal among all the publications, but several of the publications have and index below 2. The candidate has been invited to several conferences and seminars. So is the evaluator basically suggesting that I should be ashamed of having several publications in journals with impact factors lower that 2? Should I hide them from my CV and only show those with IF higher than 3? It is true that I have several publications in OSA journals such as Applied Optics or JOSA A with impact factors around 1.5-1.6. But this are fairly good journals and I am quite proud of those publications. Also the reviewer seems to be omitting that in fact I have more publications in journals with IF greater than 3 than lower. We have reached a point where it makes no sense that a publication in Nature Photonics as 6th author (to say something) becomes more relevant to the (trained?) eyes of the evaluator than a whole original research trajectory. In the “participation in international activities” section I have scored 23/25 with the comment: International experience at NYU ( 2 years). The candidate has participated in several international projects. For other CV merits I have scored 5/5 with the comment: R&D 100 Award for Instrument Development issued by the Editors of the R&D Magazine. The candidate has proven the capacity to set an independent research program demonstrated by, for instance, co-ordinating a few projects. However, the level of impact remains an open question given the impact received by the candidate during the 11 year research period reported. The large number of publications as first author and about 6 papers as the only author may indicate lack of interest in carrying out a synergetic effort towards the goals. Recently (according to the candidate himself) has the candidate began a widespread collaboration with several research groups. So in a section that is supposed to evaluate your independence and your capacity to lead your own research I am criticized for having some “only author” publications and many first author publication? This makes no sense. I highlighted this as a positive thing in my application to precisely stress that my publication record was self-earned and not because I had been making marginal contributions to research carried or leaded by other people. Obviously the evaluator did not like my remark. The last sentence of the report I do not know exactly how to take it. All I put in my application (literal words) is: “Currently I am collaborating with the following international research groups:” and I wrote a list of the groups that I am currently collaborating with. Is the evaluator then suggesting that I have not collaborated with anybody in the past? Anyway, despite being disappointed, I cannot not say I am too surprised. I already knew that what matters most is the “luck” you have with the evaluator you get. Apparently each application is reviewed by one single person. As at the end, for a given scientific panel, the number of active scientist in Spain is not so large, there are also widespread rumors of evaluators favoring candidates that directly or indirectly know (the human factor!). The list of Ramon y Cajal awardees is available here. By checking names in Google Scholar is easy to realize that there are very strong candidates, although many of them do not seem stronger than me (at least in terms of publications). Many top positions are given to researchers that tend to have several (more than 1) publications in a high impact jounal (such a Nature materials, Nature, Science, etc ) even if they are only listed as 5th author of such publications. Is this the way to establish a research career? This entry was posted in Uncategorized on June 16, 2016 by loiro. Last week I was in the 7th International Conference on Spectroscopic Ellipsometry celebrated this time in Berlin. This is a very nice series of conferences celebrated every 3 years (in earlier days it was every 4 years). My first participation was in Stockholm 2007 as fresh new PhD student and, later, I also participated in all the following editions: Albany (2010), Kyoto (2013) and in Berlin (2016). In this conference I was honored to win, together with Christoph Cobet, the Paul Drude Award. 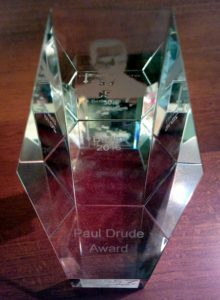 The Paul Drude Award is named in honor of Paul Karl Ludwig Drude (1867 – 1906), who invented and first applied ellipsometry. Reflecting Drude’s work related to the electron-conductivity model, emphasis is also placed on spectroscopically determining and understanding the interaction of light with matter. 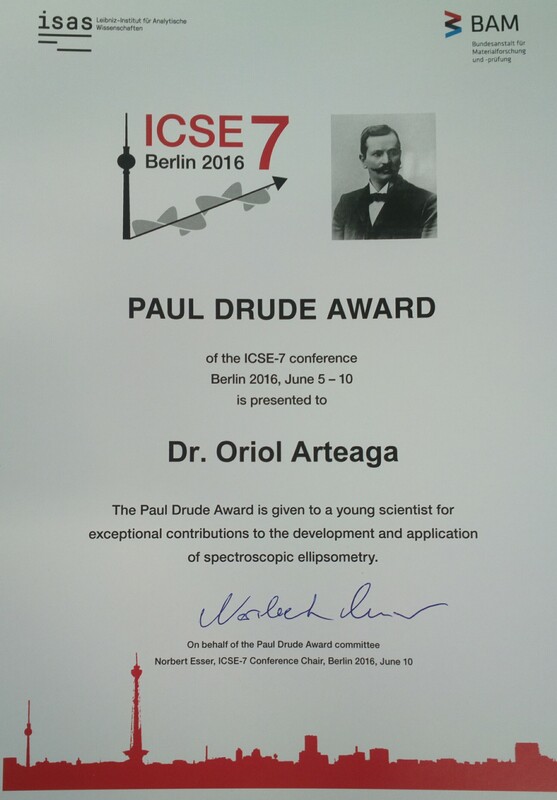 The Paul Drude Award is given at each International Conference of Spectroscopic Ellipsometry (ICSE) to a young scientist for exceptional contributions to the development and application of spectroscopic ellipsometry.